Everyone loves a reason to have a good time, and although culturesaround the world have their own unique feasts and festivals, we allshare many of the same reasons to celebrate. 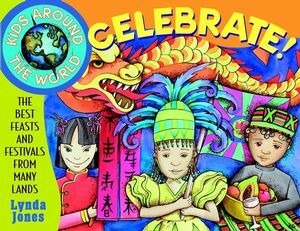 Now you can learnabout the many ways people from around the globe celebrate theirspecial days, and join in the fun! Celebrate Chinese New Year while making chiao-tzu dumplings, thenpop over to Saudi Arabia and taste delicious date-nut cookiescalled ma amoul while celebrating Eid ul-Fitr. Make an elaborateVenetian mask to wear at a masquerade ball in Venice duringcarnevale, then pound out a festive rhythm on the Igbo drum you vemade and celebrate the Iriji festival in Nigeria. Eat, drink, andmake merry with the many diverse and exciting crafts, recipes, andactivities in this book. No matter what language you say it in,celebrations are fun! LYNDA JONES is a freelance writer who has contributed to Nickelodeon, Science World, Essence, and other magazines. Her most recent book is titled Abe Lincoln. New Year's Eve: The United States. CELEBRATING BEFORE AND AFTER FASTS. Mardi Gras: New Orleans, USA. El Dia de los Reyes: Mexico.